"I don't care who you are, how much money you make,” he said. “If you don't respect our country, then you shouldn't be in this country playing football…So I would say, adios." Former Carolina Panthers and Baltimore Ravens wide receiver Steve Smith Jr., who is African-American, suggested Ditka crack open a history book. Hall of Fame quarterback Joe Namath also rebuked Ditka. “Look up the definition of oppression, and you understand that it’s obviously taken place," Namath said in a FOX News interview. However, when asked if he would take a knee during the anthem is he was playing now, Namath said "I'm not there yet." “But I’ve never walked in a black man’s shoes either,” he said. Ditka later apologized for the statement and said that he was referring to oppression within the NFL, not society in general. "I have absolutely seen oppression in society in the last 100 years and I am completely intolerant of any discrimination," he said, according to WGN-TV. 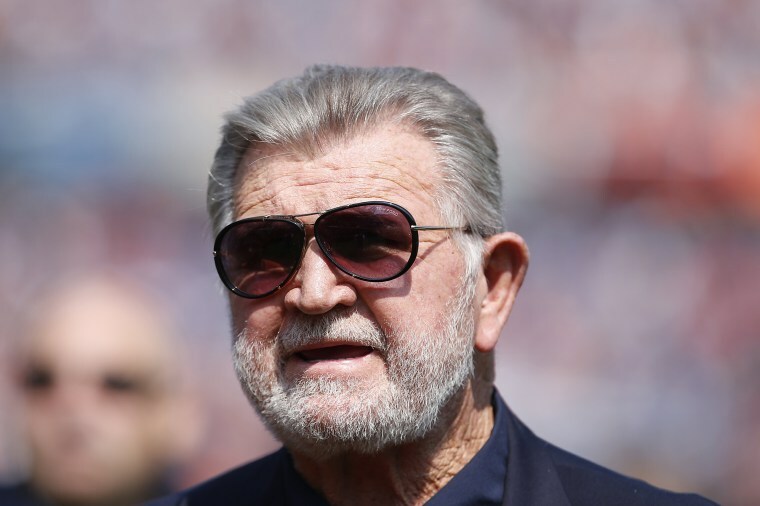 Ditka, a coal miner's son from Pennsylvania, is a strong supporter of President Donald Trump, who stoked the furor further over the weekend by saying the NFL should fire players who don't stand for the anthem. And in a Tuesday morning Tweet, he threatened to sic the IRS on the NFL. A short time later, NFL Commissioner Roger Goodell, who had called Trump's his remarks "divisive," said he believes players should stand for the anthem and announced he was working on a plan to defuse the crisis. On Wednesday morning, Trump tweeted his praise for that decision, writing that, "It is about time that Roger Goodell of the NFL is finally demanding that all players STAND for our great National Anthem-RESPECT OUR COUNTRY." The issue has been dividing fans since last season when then San Francisco 49ers quarterback Colin Kaepernick refused to stand for the anthem to protest police brutality and the oppression of black people in America.